Just over 700 Georgia FFA members will receive the State FFA Degree at the upcoming 88th Georgia FFA Convention. From that class of State Degree recipients, twelve have emerged as the 2016 State Star Finalists. The finalists for the State Star Farmer (most outstanding production agriculture SAE) are Jared Cook of the Tift County FFA, Hayden Echols of the Madison County FFA, and Alyson Pope of the Screven County FFA. The finalists for the State Star in Agribusiness (students who own an enterprise not involving production agriculture) are Chandler Kudyk of the Lowndes County FFA, De’Andre Wallace-Nash of the Newton County FFA, and Rhet Thornton of the Pike County FFA. The finalists for the State Star in Agricultural Placement (students who work in, but do not own their own agricultural enterprise) are Cejay Heath of the Treutlen County FFA, Makayla Holmes of the Sonoraville FFA, and Murdock Wynn of the Colquitt County FFA. The finalists for the State Star in Agriscience (students with an SAE based on agricultural research) are Hunter Corbett of the Lowndes County FFA, Viral Patel of the Madison County FFA and Rachel Solomon of the Northeast Bibb FFA. Each Star finalist has submitted an extensive application highlighting their finances, hours worked, skills developed and SAE growth. The selection of the four State Star winners will be determined by scoring the applications and the score from home or work site interview. A panel of judges will travel to each student and see their SAE in person, interviewing the student in their work environment. Each Star finalist, along with their parents and agricultural education teachers, will be recognized when the State Star winners are announced on stage during the first session of the 88th Georgia FFA Convention on Thursday, April 28. The State Degree is the third rung of the FFA degree ladder that student climb by developing and growing their Supervised Agricultural Experience (SAE) program. The four rungs of the FFA degree ladder are the Greenhand degree, Chapter degree, State degree and American degree. Students climb each rung of the ladder by improving and expanding their SAE. To earn the State FFA Degree a student must have earned both the Greenhand and Chapter degrees, have been an active FFA member and enrolled in an agricultural education class above the 9th grade level for a minimum of two years, have earned and productively invested at least $1,000 or worked in excess of 300 hours beyond scheduled class time, have participated in at least five different FFA activities above the chapter level, have participated in a minimum of 25 hours of community service and maintained at least a C average. Jared is a senior at Tift County High School. 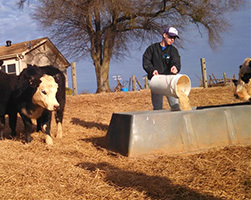 Jared’s has built a successful SAE of diversified livestock production. While in high school, Jared worked with his father to get his operation off the ground, naming it Triple C Farms. Jared’s inventory includes two beef steers, 12 market and breeding goats, two market hogs, twenty market and breeding lambs and 120 chickens. Jared plans to earn a bachelor’s degree in Animal Science, and would like to one day be herd manager for a large livestock operation. Jared’s parents are Ronald and Angie Cook, and his agricultural education teachers and FFA advisors are Ms. Lynne Cook, Mr. Jimmy Cargle, Mr. Heath Cross, Mr. Carl Nichols and Mrs. Beth Golden. Hayden is a senior at Madison County High School. 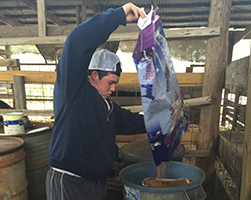 Since his FFA career began in middle school, Hayden has been interested in livestock production. His SAE began on his family’s farm, and had grown to his ownership of a herd of beef cattle and market goats. Using what he has learned about animal genetics, Hayden has developed a very successful goat operation, selling show goats to exhibitors across Georgia. Hayden plans to earn bachelor’s degree in Animal Science and Marketing and would one day like be a lobbyist for agriculture. 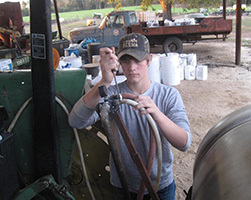 Hayden’s parents are David and Linda Echols, and his agricultural education teachers are Ms. Kathrine Bell, Mr. Deion Latimer, Ms. Kalie Hall and Mrs. Cindy Jones. Alyson is a senior at Screven County High School. Growing up on a family farm, Alyson became interested in animals at young age. She began raising and showing livestock, then decided to invest in her own herd. 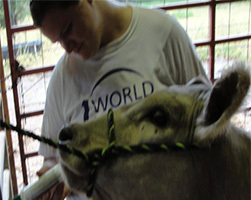 Today Alyson runs a registered cow herd that produces club calves that are sold throughout Georgia. Alyson raises replacement dairy heifers for a local dairy farmer, market hogs and meat goats. Alyson plans to pursue a degree in agricultural education and become an agriculture teacher. Alyson’s parents are Howard and Carolyn Pope, and her agricultural education teachers are Mrs. Nancy Sell, Mrs. Julie Anna Boyd and Mr. Brandon White. Chandler is a senior at Lowndes County High School. 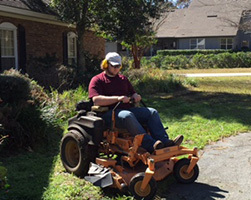 When he enrolled in agricultural education classes as a middle school student, Chandler needed an SAE, so he began mowing a few yards in his community. Today he had developed a business that services 37 yards a month. 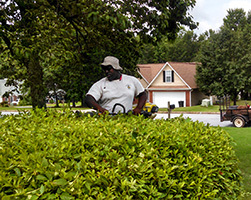 In addition to growing his skills as a landscaper, Chandler has developed his ability in record keeping, financial management and employee supervision. Chandler plans to pursue a bachelor’s degree in Agribusiness. Chandler’s parents are Nick and Kim Kudyk and his agricultural education teachers and FFA advisors are Dr. James Corbett, Mr. Quinton Hadsock, and Mr. Micheal Barnes. Rhet is a junior at Pike County High School. Rhet’s love of fishing led him to create an SAE that consisted of making and selling fishing lures. 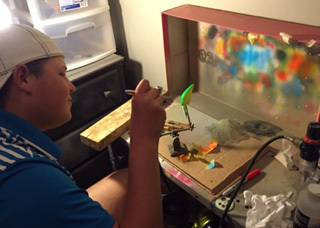 In the first year he sold nearly twenty lures, mostly to friends and family. Today the majority of Rhet’s sales are online. He has more than tripled his annual production, making and selling more than sixty lures a year. The lures Rhet makes are custom ordered. He does the stenciling and fading, and plans to expand his operation to begin making jigs and plastic worms. Rhet’s agricultural education teachers are Mr. Greg Waits, Ms. Morgan Hurkmans, and Mr. Chase McGill. De’Andre is a senior at Newton County High School. In 2011, De’Andre created his business, Dee’s Lawn Care. What began as a way to earn money mowing other people’s yards, turned into an opportunity to develop and grow a business that today services 65 lawns. De’Andre plans to earn a degree in turf management and grow his lawn business to commercial operation. De’Andre’s parents are Andre Wallace and Virginia Nash, and his agricultural education teacher is Mrs. Melissa Webb. Cejay is a senior at Treutlen County High School. He grew up on the family farm, and made the decision to develop a placement SAE based on his work producing wheat, corn, and cotton on the family’s more than 2,000 acre operation. Cejay is involved in operating and maintaining all tractors and equipment, as well as managing livestock, planting and applying fertilizer and calibrating sprayers. Cejay plans to seek a degree in forestry. Cejay’s parents are Chadwick and Kimberly Heath, and his agricultural education teacher is Mr. Al Garner. Makayla is a senior at Sonoraville High School. She has grown up on her family’s beef cattle operation, Holmes Cattle Company (HCC), which runs fifty head of Sim-Angus cattle. Beginning in middle school, Makayla had duties within the operation that have grown from feeding to administering medication, breaking show prospects, assisting with genetic decisions and coordinating the marketing efforts of HCC. Makayla plans to pursue a bachelor’s degree in biology then study large animal reproduction and eventually manage her own beef cattle herd. Makayla’s parents are Keith and Charlotte Holmes, and her agricultural education teacher is Dr. Sara Clark. Murdock Wynn is a senior at Colquitt County High School. In 1998 Murdock’s family purchased a 650 sow hog operation. Today that operation has grown to over 2,500 sows while remaining farrow to finish. 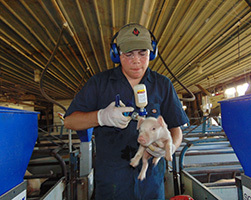 Murdock is involved in all aspects of the operation including feeding, sanitizing buildings and facilities, genetics and processing of baby pigs. Murdock plans to pursue a degree in Animal Science and Agribusiness, then grow his family’s hog operation. Murdock’s parents are Ronnie and Penny Wynn and his agricultural education teachers are Mr. Stacey Beacham, Mrs. Adrienne Smith, and Mr. Gene Hart. Hunter is a senior at Lowndes County High School. 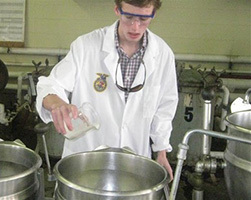 When he entered agricultural education in middle school, Hunter knew that he needed an SAE and had great interest in research, so he chose a project that allowed him to use the scientific method to solve an environmental problem by proving, over a five year period, that waste agricultural product cotton gin trash could have completely cleaned up the 2010 BP oil spill. Hunter plans to attend medical school. His parents are Dr. James and Mrs. Tracy Corbett; and his agricultural education teachers are Dr. James Corbett, Mr. Quinton Hadsock and Mr. Micheal Barnes. Viral is a senior at Madison County High School. As a freshman, Viral enrolled in both a chemistry class and a basic agriculture class, and found a research topic that he could use for both classes. Viral began researching the topic of super cooling, the phenomena where the temperature of a solution or food material is reduced below its freezing point without ice crystallization occurring. 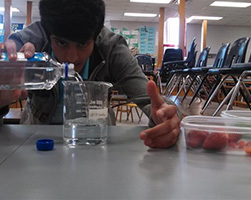 He began super cooling peas and strawberries as part of his Food Science & Technology SAE. Over the past four years, Viral has used the scientific method to completed three different experiments impacting the preservation of food. 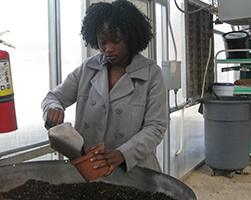 Viral plans to earn a degree in Agriculturla Education and become an agriculture teacher. Viral’s parents are Kaushik and Dharmistha Patel, and his agricultural education teachers are Mr. Kathrine Bell, Mrs. Cindy Jones, Mr. Deion Latimer and Ms. Kalie Hall. Rachel is a senior at Northeast Bibb High School in Macon. For the past two years, Rachel has maintained a research SAE focusing on the effects of the microbial fuel cell on kalanchoe plants and how to calculate chlorophyll content of a plant using Arnon’s equation. Rachel says that she became intrigued with the concept of researching the current state of the world’s energy reservoir. She began to create a plan for displaying the qualities of the microbial fuel cell that could improve the agriculture industry and become a new source of electricity. Rachel plans to pursue a degree in Agricultural Communications. Rachel’s agricultural education teacher is Mrs. Lula Curry Williams.